Infinite Art Tournament: At the Movies: "Requiem for a Dream"
Ebert: Three and a half Stars. To say that Requiem is an anti-drug film, in any event, is to dumb it down considerably. It's more fair to say that it's a movie about the psychology of addiction. It's characters wrestle, or fail to wrestle, with their addictions not just to narcotics and amphetamines but to more subtle stuff like a rich diet, coffee, television, risk-taking, and perhaps flattery. Does anybody here not compulsively consume something that they wish they didn't, or engage in some sort of behavior that is bad for them? No? OK, then this film will be a little disturbing for you as you watch the rise and shockingly sudden fall of its characters, and find yourself cataloging your own struggles with addiction, and wonder what sort of consequences might be down the road. Obviously, I'm not saying "being hooked on coffee is just like being hooked on heroin!" But Requiem for a Dream makes you think about the analogy. Requiem is also noted for its novel cinematography, which I think would be fair to call subjective and impressionistic. Subjective, because Aronofsky wants to make you feels like you are sharing the characters' experiences. To this end, there are lots of point-of-view ("POV") shots, and the speed of action and of the lengths of cuts are sped up and and slowed down to reflect the dilation of time as characters get high and get sober. When they feel wonderful, there is often more light and color in the world; when they come down, the world is much browner and grayer. Impressionistic, because there aren't all that many sustained shots that show obvious action happening in an obvious context. When characters sell drugs, we don't see customers sidling up to them, negotiating a sale, and leaving; we set a rapid-fire succession of images: faces, money, little packets passing from hand to hand, zip zip zip. When people consume drugs, or other addictions, there are stylized passages that convey the moment through a quick series of symbolic images. 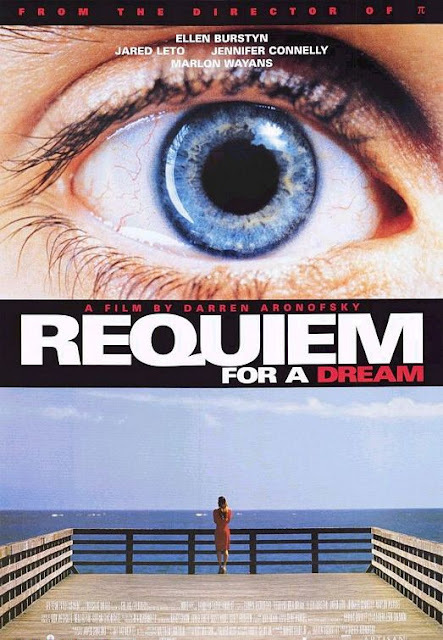 I've read that Requiem has something like four times the number of individual shots as an average movie of its length, which seems about right. It is a very distinctive and effective style of storytelling. Plot: As the movie starts, we have a wayward middle-class kid, a relatively ambitious poor kid, and a slumming upper-class kid: Harry, his buddy Tyrone, and his girlfriend Marion. They are living a fun, dynamic, drug-fueled lifestyle on the margins of Brooklyn. When they have the bright idea of buying in bulk and selling retail, business is great at first. Meanwhile, Harry's lonely mom is prescribed amphetamines by a jaded weight-loss doctor, and feels great at first. But eventually, problems crop up. Although the action of the movie is simultaneous, Harry’s mother is also clearly living two or three decades earlier than he and his pals. This is not a movie that is too concerned with realism. Visuals: This film is a real festival of virtuoso editing. Dialogue: There are some very strong moments of dialog, particularly in a scene where Harry visits his mother. Prognosis: Certainly a fine movie-lover's movie, and also of enduring interest to anyone interested in addiction issues. Probably a good film to catch if you've been debating the pros and cons of taking up heroin. I will say, too, that this movie stayed very present in my mind – “haunted” me, almost, for a couple weeks after I watched it. That is a strong measure of artistic success.